Looking for IBM Infoprint 1116 Parts? The IBM 4516 Infoprint 1116 is a high-speed monochrome laser printer which is an excellent printing solution for a desktop or small workgroup environment. The printer offers great value with its high-resolution and versatile networking capabilities, all for an affordable price. The IBM 4516 Infoprint 1116 Model 001 is a base model low-voltage monochrome laser printer with a 133 MHz RISC processor, 8 MB SDRAM memory, 300 to 1200 dpi image quality, print speeds up to 16 pages per minute (ppm), 150-sheet input tray, IEEE parallel interface, and language support. The IBM 4516 Infoprint 1116 Model N01 is a network model low-voltage monochrome laser printer with a 133 MHz RISC processor, 16 MB SDRAM memory, 300 to 1200 dpi image quality, print speeds up to 16 ppm, 150-sheet input tray, USB interface, integrated 10/100BaseTX Fast Ethernet interface, and language support. The Infoprint 1116 comes with a one-year on-site warranty, which provides quick replacement if one is needed right away. The low acquisition cost and flexible networking options make this printer ideal for small businesses. 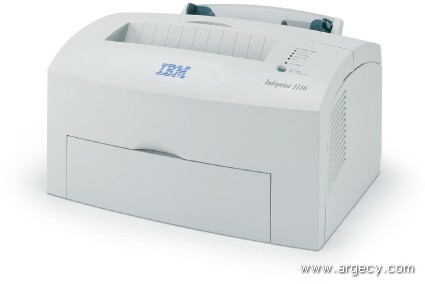 The IBM Infoprint 1116 is an A4/letter monochrome laser printer with print speeds of up to 16 pages per minute. Infoprint 1116 comes with a 150-sheet input tray and an auxiliary tray (single sheet) standard. An optional 250-sheet drawer is available. The Infoprint 1116 printer has two base models and two network models. The base models include the printer with 8 MB memory. Model 001 is the low-voltage model and Model 002 is the high-voltage model. The network models include a 10/100BaseTX Fast Ethernet card and 16 MB of memory. The network models include the 250-sheet drawer feature as standard. Model N01 is the low-voltage model and Model N02 is the high-voltage model. The Infoprint 1116 controller has a 133 MHz Toshiba 3927 RISC processor. It comes with robust data stream support with PCL 6, PostScript 2, and PPDS standard. Base printer models have 8 MB SDRAM standard. Network printer models have 16 MB SDRAM standard. The standard memory is soldered on the controller board. There is one slot available for SDRAM memory and one slot for flash memory. The controller supports a maximum of 72 MB of SDRAM memory (total of soldered and memory slots) for base models and 80 MB of SDRAM memory (total of soldered and memory slots) for network models. A maximum of 4 MB of optional flash memory is supported. Infoprint 1116 base printer models come standard with an IEEE 1284 Parallel interface with a Type B connector and a USB interface. Infoprint 1116 Network printer models come standard with USB interface and integrated 10/100BaseTX Fast Ethernet interface. Note: First Copy time is defined as the elapsed time when hitting enter on the PC to the page exiting to the output bin. Paper is picked from the primary tray and paper exits to the primary output bin. Media is letter-size paper printed in 300 and 600 dpi simplex printing. The Infoprint 1116 printable area is limited to within 4.0 mm (0.158 in.) of top, bottom, left or right edges of the media. Any information placed outside this specified printable area will not print. The infoprint 1116 will have UTF-8 code support standard. UTF-8 code is a particular way in which fonts are accessed. UTF-8 is required for SAP printing and had previously only been available in the Barcode option card. Moving this function standard in the printers allows for SAP support out of the box. UTF-8 is available for PCL and PostScript fonts. The fonts in the PCL emulation are compatible with the fonts in the HP4500 and include four additional fonts and many extra symbol sets to support extra languages and applications. The fonts in the PostScript emulation are compatible with Adobe PostScript 2 and include 20 additional fonts. Note: For all of the following font listings, font order is partially alphabetical and partially functional. All models come standard with one 150-sheet paper drawer, one auxiliary tray with a single sheet capacity and one standard 100-sheet output bin. See tables below for standard and maximum media capacities. The printer has a 100-sheet output bin and there are no output features. Note: (1) Minimum feed size = 76 mm x 127 mm (3" x 5"). Preprinted forms and letterheads should be selected using guidelines found in the printer User's Guide. The chemical process used in preprinting may render some papers unsuitable for use with the Infoprint 1116. Use letter- or A4-size sheets only. Transparencies specifically designed for xerographic copy machines or laser printers may be used with the Infoprint 1116. Labels should be selected using guidelines found in the User's Reference, Complete Printer Reference, and be tested for acceptability. Infoprint 1116 is compatible with applications running under the following operating systems for either local or network connections. The software applications that operate with most Apple LaserWriter printers will generally operate with the Infoprint 1116. The Macintosh 128, 512, and 512e Computers are not supported. NetPnP senses when a new IBM printer is attached to the network and automatically creates a shared printer object on the Windows NT 4.0 or Windows 2000 system. Furthermore, NetPnP notifies end-users via e-mail that the new network printer is available for printing. Designed for Windows NT 4.0 and Windows 2000 environments, Net PnP makes the Infoprint 1116 printers available to end-users within seconds of network attachment. These printers are certified Solaris Ready by Sun and include Infoprint 1116 Enhanced Printer Drivers for Sun Systems and Sun specific documentation seamless installation and use in Sun Solaris environments. The IBM network printers are Ethernet-ready for use in Sun networks. Note: All printer features are customer installable. This input option can be installed beneath the printer to offer an added input source which holds approximately 250 sheets of 20 lb. paper. For customer environments with space or budget constraints that would prevent purchase of the complete input drawer option, a separate tray option is available. Drawer includes tray plus support unit. For example, the tray might hold an alternate media, such as letterhead, and temporarily replace a tray with standard media as needed. This version of the tray holds approximately 250 sheets of (20 lb.) paper. This cover is designed for 150-Sheet tray that comes standard with the printer. This cover is designed for 250-Sheet optional tray. This adapter is installed on the printer's parallel port and receives its power through the parallel port. It utilizes a standard 25-pin D-shell females connector and supports baud rates up to 19,200 bps for RS-232C or 38,400 bps for RS-422. This feature is not supported on the network models (N01/N02). All network connection features are external for the Infoprint 1116 and require the base model printer. The network features plug into the parallel port of the printer. The MarkNet N2000 Series also supports and works in Infoprint 1116 printer. Optra Forms Director is a Windows NT or Windows 2000 server-based program. Using o additional host software (iSeries, UNIX or Mainframe), the host application sends a print spool file to a Windows NT or 2000 print queue. Optra Forms Director service automatically pareses the print spool file into single or multiple print jobs using Microsoft Visual Basic Script or JScript methods and Named Pipes.